Welcome! Reader, Fellow Musical Traveller and Explorer! Welcome to the blog that loves world, roots and folk music and helps you enjoy it wherever you are! Hello also to the blog that supports Northeast England world, roots and folk music venues! Welcome to the blog that supports Northeast England Roots Music artists! 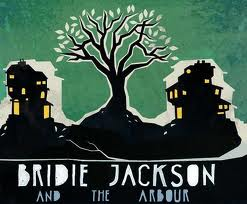 Bridie Jackson and the Arbour! 7th edition now out on Soundcloud , Podomatic at : so you can now catch Newcastle Roots Music Radio in your podcatching software! And tadahhhh! As said above Newcastle Roots Music Radio is now on I Tunes. So if you have I tunes software on your computer just subscribe (free!) and it will appear for you monthly! By the way you can have I tunes software on your computer/laptop/tablet/ even if you aren’t a Mac user. You can also catch up on all of the above platforms on the Newcastle Roots Music Radio that you missed! All the links at the end of this blog so scroll down! Most of the above music can be purchased from and listened to first, at specialist Roots music retailer Coda Music. They have helpful , knowledgeable and friendly staff! Many of the CDs featured on this podcast are purchased from Coda. Mike Vass, former Malinky member had a sleepless night , a fascination with the month of December and decided he needed to explore that month musically. I for one am very glad that he did! The album begins with slow meandering yet stately commencement of “Wintro”, then the flowing melody of “Looking Thru” with a great guitar melody with the fiddle singing plaintively above it-I was totally gripped by Mike’s heart achingly beautiful month driven music and needed more. I was not disappointed. All of the creations are of the highest standard. Philip Glass-esque/Spiro-esque sounds in “Snowfall” and “Slide”; Pane with its stark chords reflecting the bleakness of the weather with real hail sounds and the multi-layered Cycles. This is an album of immense variety, fascinating in conception, of varying moods, textures and it makes me smile! Canadian Singer-Songwriter, member of the wonderful “Wailing Jennys” Anna’s album is an album that has grown out of love and passion for justice . It is great to hear music where you know that the person concerned is passionate not only about their art but the world we all inhabit and depend on. Anna is clearly one of these people. She is also able to command some excellent musical associates including fellow Canadian Bruce Cockburn, providing some of the vocal and electric guitar backing.The album gets off to a thumping start with for me what is an anthemic song “The End of the Road, a song that challenges oppression, celebrates solidarity and the power of truth. It has a stomping rhythm , choppy guitar strumming and a powerful chorus.I hope it is all going to be this good! It certainly is.A change of style with track “G20” with a Klezmer feel, and from there on as well as her socially challenging lyrics as well as a couple of songs by other writers it stays at this standard. There’s plenty of variety, the arrangements are tight. “Will of How” finds Annabelle in a very smoky jazzy kind of mood, a bit Billie Hollidayish. There’s some bluegrassy numbers, “All Have Some” having some good grinding country style fiddling. In a more Country/Folk style is “Foxtail” a happy sounding country romp but with lyrics which reflect on death, life and it’s cycle. This is an album that will keep giving back to you as its richness musically and lyrically unfolds on repeated listenings. Wow. From the moment I heard Luisa Lyne’s voice I was utterly drawn in by its ability to soar and to create an atmosphere of magic, mystery and wonder. Sung in Yiddish it claims to breathe “life into songs and poetry that have lain forgotten for many years”. “Tumbalakaka” invites the listener in at the start of the album and I could not help but being drawn in! Sublime stabbing double base ushers in “Ovent Lid”, with plenty of great Yiddish melody. Louisa’s voice provides a release from the tension that she and her band di Yiddische Kapelye manage to generate. “Lidl Fun Goldenem Land” has an enchanting accordion backing that to my mind creates a sound not unlike that of a church organ purring in the background. Whilst there is more starkness and bleakness albeit utterly compelling later in the album there’s also lighter moments including the snapping percussion involved in “Dos Keshenever Shtikele”. Not only is this an album of the highest quality but Luisa’s voice remains superbly compelling throughout ably supported by di Yiddishe Kapelye. More enchantment not from Sweden but from Newcastle courtesy of Bridie Jackson and the Arbour, Newcastle Roots Music Radio NE artists of the month Their beautiful website describes them as follows: “Bridie Jackson & The Arbour are a Newcastle based four-piece, who use sparse instrumentation and intriguing vocal harmonies to create music that is simultaneously beautiful, ethereal, dark and powerful.” Well that certainly is true here. This utterly engaging piece drew me in instantly and once I had heard it I was not sorry that I could not get the melodies and the overall feel of “Scarecrow” out of my head! Written by Debt Records stable mate Louis Barrabas, this talented wordsmith spins a tale of woman looking back from beyond the grave at her wedding dress which rests upon a scarecrow. The lyrics meld beautifully with gorgeous and varied arrangement making this an absolute musical delight melodically, vocally and rhythmically. If you want your gigs to be included please e mail me with all the relevant details including any weblinks a few MP3 tracks of what you will be playing or a CD would also be useful. So that I can give them some airplay on the Podcast/On my occasional NE1Fm show/DJ night hope subject to what’s going on that month. 5 Gigs to Go To….amongst many!!! Making Tracks has been a fantastic series of World Music concerts featuring amazing music from all over the world. This month sees the Yiddish Twist Orchestra touch down on Tyneside direct from London. : The Guardian described them as follows: The Yiddish Twist Orchestra are a band with a mission, and their own quirky mythology. Their aim, they say, is to revive the forgotten music of 50s London, a time when klezmer and other Jewish styles interacted with West Indian and Latin dance music, early rock'n'roll, and the Twist (or der shvitz, as they insist it was known before it was taken up by the Americans). Klezmer colliding with Cuban..can’t wait! Funked up New Orleans big band jazz hits Stockton and how! Direct from the bayou of La Suisse, French Switzerland , charged up Cajun from this powerhouse of a Cajun band. Recommended! Top Irish melodeon/accordionist Sharon Shannon has played with best including been featured in the “Transatlantic Sessions”. This will be a night in the company of one of the finest with jigs, reels, airs and more! Great vocal harmonies and lyrics drawn from the Northeast folk tradition from these bonny Teesside lads! It was near on a full house who witnessed the 7 piece folk band, Frigg, from Finland/Norway. Their unique take on Nordic folk was tinged with a bluegrass feel- What an evening of high class entertainment it was! Chris Pentney (Head of the Folkworks programme at the Sage, Gateshead) was clearly thrilled to see the packed hall, and there was a real sense of expectation about this gig. From the very beginning the dynamic sound of fiddles, double bass , mandolin, deep folk grooves, lively melodies, unexpected musical twists, superb musicianship and the sheer overall dynamism of Frigg’s offering gripped the audience. It wasn’t just the music that engaged the crowd but also the witty banter and warmth from band members. Frigg are an instrumental band and the concert got off to a rip roaring start with a tune which in English roughly translates as “Let’s Party”: Lively, joyous and with a thumping double bass accompaniment. Funky rhythms followed in a tune called Bo!, one of many toe-tapping melodies. These included more complex tunes (I think it was called “Economy Claus”?) with changes of time signatures , discordant mandolin, and jazz influences intertwined with folk . It was not all high octane, there were quieter more lyrical moments including a gentle waltz but this was followed with the title track of the recommended new CD “Polka V” , an energetic number interspersed with moments of greater tranquillity. 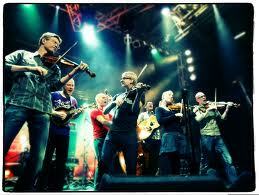 The energy, joy, contrasts and dynamism of their music -called “Nordgrass” because of the Nordic/bluegrass after the break. Hall 2 was not going to let Frigg go when they announced that their night’s work was done and the enthusiasm of their playing was mirrored by the footstomping that went on demanding an encore which they were more than pleased to give! They then surprised the audience by inviting us to join them at a late night session at the Newcastle city centre pub the Lady Greys. An early start at work next day did not allow for this! If you get the chance to see Frigg, GO!!! You can hear their 2005 album “Oasis” on the Spotify website. Bridie Jackson, the four member folk group from Newcastle, attracted a full house at this intimate venue which I think is perfect for their sparse instrumentation and often ethereal feel. The visual spectacle was added to by the addition of some fairy lights which emphasised the intimacy of the setting and gave the occasion a really special atmosphere. Clearly a lot of thought had gone into the staging of this event. Beccy Owen, a local singer provided a perfect start to the evening with her soft sensitive powerful voice and skilfully crafted self-authored songs. She was joined on stage, by another local singer-songwriter, for some numbers by singer-songwriter Matt Lucas. They combined well together and gave a performance that charmed the audience. The scene had been well set for Bridie and her band which is comprised of Bridie (guitar, piano, lead vocal, and belleplates), Jenny Nendick (cello, belleplates), Carol Bowden (vocals, percussion, belleplates), and Rachel Cross (vocals, violin, belleplates). Bridie and her band’s video to their new single “Scarecrow” provided the introduction to their set. It is a beautifully shot piece in black and white. A link is at the bottom of this review to check it out for yourselves. The band are signed to Debt Records. Fellow Debt signee, Louis Barrabas is the author of the stunning lyrics for the song. Louis has been modest enough to say that Bridie will probably be known for them in the future rather than him, so impressed has he been with the single, which was launched at the gig. It’s out now and is available on limited CD release and download. Full information on the band’s website (see link below). The set which included the single and its B side “All You Love is All You are”, and material from the album “Bitter Lullabies” emphasised how talented the band are. Not only are the lyrics beautifully written but the compositions and settings of the songs are incredibly varied. Bridie sings with great intimacy and sensitivity but she can also deliver foot stomping hollering with a raw powerful edge. The ensemble really captivated the audience in with their exquisite delivery including with the use of the handbelles, a gorgeous sound. Apart from their clear musical prowess, the band also came across as really revelling in entertaining the crowd and it was nice to hear Bridie and band thank those who had made a particular contribution, beaming with smiles as they did it. My only moan is that I just wished it had gone on longer. I could have sat and listened for hours! And finally: RootsoftheWorld wishes you a happy month musically and otherwise! Be careful. And be nice. Bye for now! J Oh and Happy New Year once again! I would prefer to get podcasts out on the 1st of the month, except when real life barges it into being a bit later as this is a one human operation, not a multinational behemoth and I have a non-musical day job…so bear with me!